A week ago, reports indicated that Amazon was putting together a new function for Amazon video users that is truly innovative. The idea would be that Amazon would eventually be a place where you could go to stream every service you subscribe to, and today the company took its first steps toward that ultimate goal, releasing the Streaming Partners Program. So far, traditional subscription cable channels Showtime and Starz are engaged with the service, among other companies, meaning Prime users can access their streaming Showtime or Starz accounts through Prime. In addition, current Prime subscribers who don’t already have access to the likes of Showtime and Starz can totally get good deals on both services. 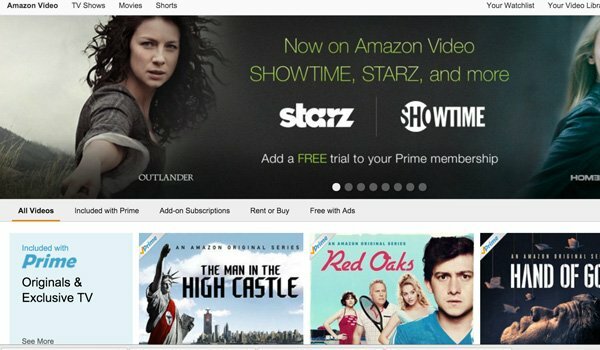 So, to be clear, Prime hasn’t totally added Showtime and Starz for free for users. The idea is to make things easier on Prime users by allowing users to access all of their subscriptions easily and seamlessly. For the services that have already agreed to become a part of the Streaming Partners Program, Amazon is going to take over handling customer service, will keep users’ credit card information on file, will remind users when they need to re-up subscriptions and more. To bolster the new product, Amazon video even changed up its home page to include the new subscriptions. However, what is theoretically most valuable about the Streaming Partners Program is the ease of use. It’s convenient to have one account to access different streaming programs. Even better, it’s convenient to have one unified search and browse function to access all of the subscriptions. Obviously, this would be even better if the likes of Hulu, Netflix and Crackle, HBO Go and more would all be available together, but that’s going to be a tough nut to crack. It wouldn’t, in theory, cost Netflix or any of the other companies anything to let Amazon Prime host their services, but it would make Amazon’s business more viable, and other companies aren’t necessarily in the business of helping out competitors for the sake of helping. Still, this is a start. Both Showtime and Starz work because they have plenty of originals that can be streamed but don’t have a multi-device streaming service like HBO Go to complement their cable offerings. Starz Play obviously exists, similar to how you can watch network shows on ABC.com or NBC.com if you sign in with your cable information. However, with the new Amazon deal, you can get that content much more efficiently. Plus, if you don’t have cable and have always wanted to watch Starz’s Outlander or Showtime’s Ray Donovan, for instance, now you can get those offerings through Amazon for only $8.99 a month apiece. On top of this, you can even get a free trial subscription for both services. You can learn more about how to access the Streaming Partners Program over at Amazon.